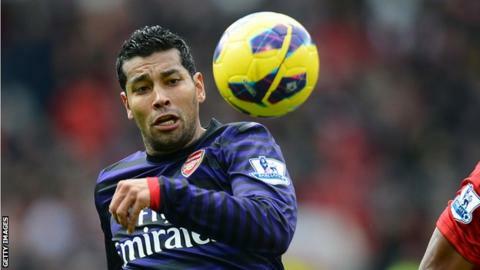 Arsenal left-back Andre Santos has travelled to Brazil to finalise details on a loan move to Gremio until the end of the season. Santos has made 13 league starts since arriving from Turkish side Fenerbahce in a £6.2m move in August 2011. His imminent exit has restricted Arsene Wenger's left-back options as Kieran Gibbs has been ruled out for another four to six weeks. Recent signing Nacho Monreal, 26, is cup-tied for the Champions League. However, Thomas Vermaelen, who missed Saturday's 1-0 win at Sunderland with an ankle problem, is close to returning and can play at left-back. And another option is 20-year-old Spaniard Ignasi Miquel, who has made just one league start for Arsenal. Brazil international Santos has struggled to adapt to the Premier League and upset Arsenal fans when he took the bizarre decision to ask former Gunners striker Robin van Persie to swap shirts at half-time during the 2-1 defeat at Manchester United on 3 November. Santos has fallen further down the pecking order since and is surplus to requirements, despite the absence of Gibbs and Vermaelen. Monreal will not be able to play in Arsenal's Champions League round of 16 tie with Bayern Munich later this month after representing Malaga in this season's competition. Meanwhile, midfielder Jack Wilshere should be fine for next weekend's FA Cup tie against Blackburn after receiving a kick on his thigh at Sunderland. Laurent Koscielny has a calf strain but could be in contention for the weekend. If he does miss out, he is expected to be fit for the Champions League last-16 tie against Bayern Munich next Tuesday.